Uberdude I understand that the 4-4 point was not played as the first corner move until the Shin Fuseki era with the new ideas from Kitani and Go. Before that the 3-4 was the usual move. But 4-4 points were used in handicap games. So why did no one think to play them in even games? Did everyone think they were bad and thus a bit of a waste of the handicap? Were many joseki for them developed, or did their prevelance in handicap games mean white would play weird moves against them. In a few old handicap games I see black play the large knight's move as an answer to the approach. The 4-4 point was known and used earlier. Shuei used it, for example. I seem to recall hearing that it was considered a difficult opening to control. I think even earlier Shuwa played 4-4 openings. 2) Even in handicap games, especially the common 2 and 3 stone handicap games, normal joseki were often played. The long knight's move was common (iirc, Go Seigen was really the one to make the regular knight's move joseki popular). 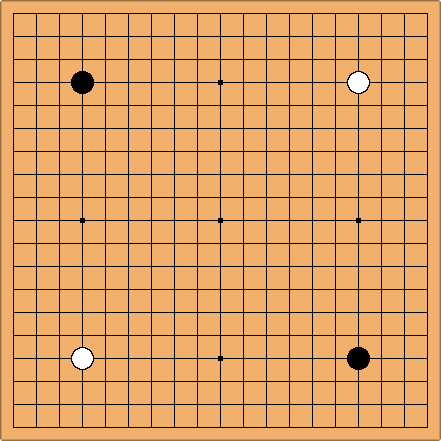 In ancient China, games of Go started with this position, with White playing first. This system is called 座子制 in Chinese, but I don't know what this is called in English. In the 1600s, the Japanese abolished this system in favour of the current system. The Chinese Weiqi Association formally abolished this system in 1949. I have also seen references to this system in the printed literature, but I don't have the books on hand right now. There's a good review of an old Chinese game with this setup at http://www.gocommentary.com/free-videos/greatest-games-ever-played-04-huang-longshi-vs-jiang-tianyuan.html.